AVID Pro Tools Ultimate 2018 Annual Subscription : This fully-loaded, industry-standard audio/music-production powerhouse gives you the straightforward control and flexible production power that has made Pro Tools Software the DAW of choice for cutting-edge engineers for over two decades. And now, with Avid Cloud Collaboration and the Avid Marketplace, Pro Tools Ultimate Software gives audio professionals the flexibility to access this industry-standard software in more ways than ever. Includes Activation Card, requires iLok ( Optional ). * Must be renewed every 12 months or a higher reinstatement fee will be applied. Pro Tools 12 Software comes loaded with a complete studio worth of powerful 64-bit AAX music-creation and sound-processing plug-ins. 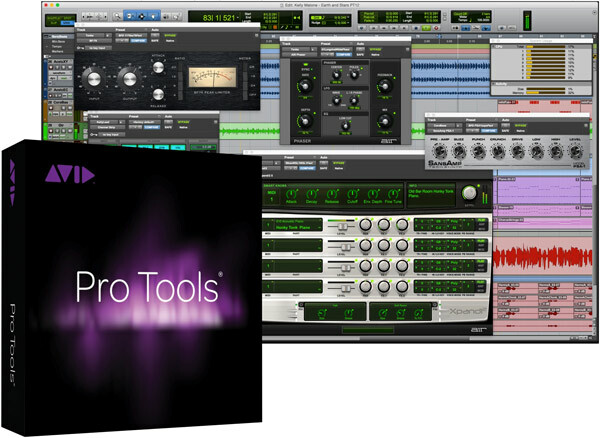 There are over 70 plug-ins included with Pro Tools 12 Software. Avid's revolutionary AAX plug-in format provides extreme quality and stability, making it easy to get great results quickly without having to worry about technical interruptions. Automatic delay compensation even ensures that your mix remains intact, even when you pile on the plug-ins. What's more, AAX plug-ins allow you to take projects back and forth between your Pro Tools 12 Software system and Pro Tools 12 Software|HDX systems, so collaborating with high-end professional studios is super easy. As wonderful as AAX plug-ins are, they only scratch the surface of what Pro Tools 12 Software has to offer. Much of its real production power is built into the environment itself. Flexible functions such as Avid's multitrack Beat Detective and Elastic Audio let you fix timing issues across your entire mix. Track compositing functions also let you quickly merge multiple takes into a single flawless performance. Full support for Artist Series and other EUCON-equipped control surfaces lets you take total command of Pro Tools | Software beyond the capabilities of HUI-based controllers. And thanks to Pro Tools | Software's faster-than-real-time offline bounce functions, mixing down stems and freeing up processor power is extremely simple. As comprehensive as Pro Tools 12 Software is for recording and editing audio, it's also the weapon of choice for music composers and electronic musicians. Not only does Pro Tools | Software include a full lineup of great virtual instruments, but it also gives you the environment and tools you need to get the most out of them. If you're a traditional composer, you'll love how easy it is to import your scores or create new compositions in Pro Tools 12 Software's versatile score editor. And if you're into modern MIDI production, Pro Tools 12 Software's massive collection of MIDI tools will absolutely blow your mind! The power of Pro Tools 12HD Software extends far beyond the realm of music production, making it a favorite for video post and broadcast professionals around the world. With software-spanning interchange options such as OMF/AAF/MXF interchange, Clip Gain metadata support, and a Unified Video Engine that can play most common HD video formats without the need for transcoding, integrating your Pro Tools | Software rig with Avid Media Composer is a snap.